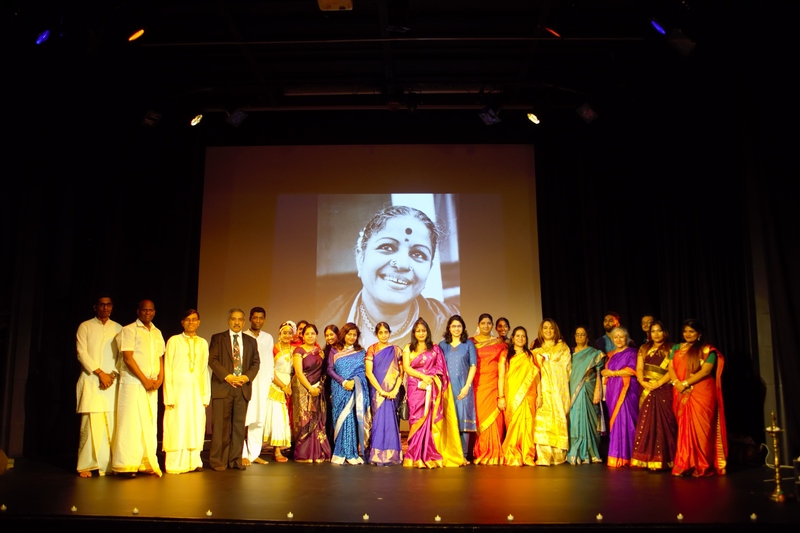 The Hundredth birthday of the Queen of Music, Bharat Ratna,Late MS Subbulakshmi was celebrated with the grandeur of an Indian festival, at Bharatiya Vidya Bhavan, London. The event, “Homage to MS” had the added significance of being on her actual birth day and on the stage where she sang in the seventies in London. The artistes performed with God-like devotional intensity to an audience who were keen MS admirers. 150 men, women and children in the audience, were mesmerised and enchanted for three hours, as the magical music melody poured into their ears. All those who volunteered to sing/dance were given the opportunity to pay their tribute. The song numbers and dances presented at the programme were arranged, so as to adorn the garland of song offerings to the object of devotion with the widest possible variety of songs sung by MS herself. The dances included the three different forms of Bharatanatyam, Kuchipudi and Mohini Attam. The songs were in almost all the languages MS sang-Sanskrit,Telugu, Tamil ,Hindi and Bengali. The song genres included devotional songs as well as patriotic ones composed by great personalities like Adi Shankara, Jayadeva,Annamacharya, Purandara dasa, Goswami Tulsidas,Meerabai, Tyagaraja, Muthuswamy Dikshitar, Swati Tirunal , D.L.Ray and Rajagopalachari. The programme started with ‘Ganesha Pancharatna’,sung by Ms Biranavi Kirupakaran,Ms Abeshaa Mahendran and Ms Shivani Sekar; followed by highly talented and melodious singers, Ms Srinidhi Padmanabhan, Ms Jayashree Padmanabhan,Mrs Durga,Mr Shreekantha Sharma, Smt Rathna Srikantiah, Miss Ruchira Srikanth,Smt Pushkala Gopal, Dr Annapoorna Kuppuswamy,Mrs Veena Pani, Ms Kavya Rajagopalan, Ms Arifa Khan, Ms Prakriti Ganguly. Kuchipudi performance by Mrs Deepa Viswamohan, Mohini Attam by Ms Ranjeetha Chowalloor, and Bharatanatyam performances by Smt Neeta Sarangapani and Dr Sandhya Anantharaman added grace to the show. They were ably supported on the Violin by Achuthan Sripathmanathan and Mridangam by Vijeyarajah Mylvaganam. The programme was presented in the katcheri format with high intensity songs like ‘Bhavayami’, ’Rangapura Vihara’, ‘Jaya Jagadheesha Hare’ taking the programme to its zenith, after starting with milder and simpler compositions like ‘Narayana Ninna Namada ‘; and again sliding downhill with less intense songs like ‘Amar Janma Bhoomi’ and ‘Kurai ondrum illai’ The programme came to its grand finale with ‘Ksheerabdi Kanyakaku’. The musical evening ended with group singing of ‘Maithrem Bhajatha’(Composition of Paramacharya of Kamakothee Peetham) conveying the message of world peace. Mr. Kamisetty Srinivasulu , former Director of Annamacharya Project at Tirumala Tirupati Devasthanam (TTD) , spoke briefly, about his memorable association with MS in her rendition of Annamacharya keertanas. The event was conceived by Mrs. Geetha Kaza, anchored by Dr Bhanu Sistla,organised by Kaza Business Consultants Ltd.